Hiver et Café: [Blog Tour] Children of Blood and Bone by Tomi Adeyemi + giveaway! 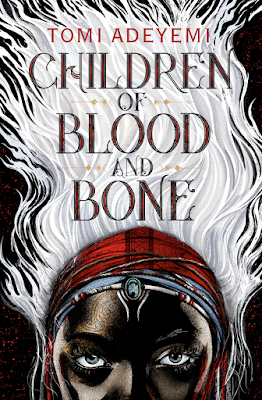 [Blog Tour] Children of Blood and Bone by Tomi Adeyemi + giveaway! 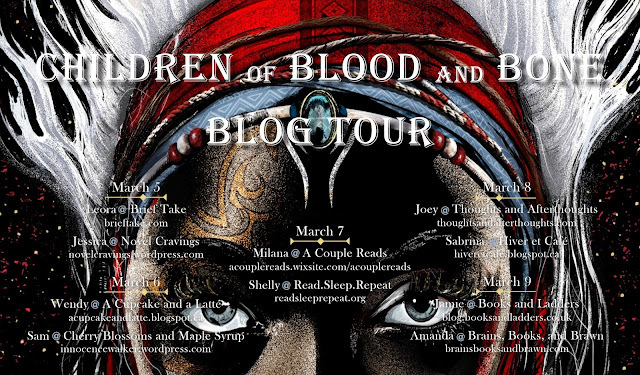 I have the great pleasure to be a part of the blog tour for Children of Blood and Bone by Tomi Adeyemi! It's a really buzzed about book right now, and I'm sure you're wondering if it lives up to the hype. Stay tuned for my review and a giveaway! I received an advanced copy from the distributor as part of the blog tour in exchange for an honest review. HOWWWWW DAREEEE YOUUUU. Like How dare you end the book like that???? I am a curious person. I need to know things. AND I NEED TO KNOW WHAT HAPPENED. If you can't tell, the book ends with a cliffhanger. Not in a bad way. I am just impatient and curious af. Children of Blood and Bone is a novel that follows Zélie, a girl who is visibly a maji due to her white hair. Her people were stripped of their power though, when the king of Orïsha wiped magic from the land and had maji slaughtered, including Zélie's mother. Her people are oppressed and treated like dirt. One day Zélie happens on a way to bring magic back to the land. She teams up with her brother and the rogue princess to do so, all while escaping the pursuit of the crown prince who seeks to prevent magic from ever returning again. This book is a tome. It's a brick. It's massive. My advance copy is 600 pages long and while it's a massive book, I managed to devour half of it in a single night, staying up until the wee hours of the morning. Children of Blood and Bone is a page turner that has you hooked on the rich world and the complex characters. And what a rich world Adeyemi has created! It's inspired by west African history and mythology as the author has stated. I have 0 knowledge about this, though I will later probably look it up on wikipedia and at the library simply because mythology is fascinating. There is a crash course video pertaining to an African pantheon of gods which coincides with the inspiration that permeates the world that the author has created. The world that Adeyemi has created has a clear and complex history with its brutal conflicts and its own lore. I've stated before that religions in fantasy novels is one of my favourite things ever and its no different here. The novel is told in differing points of view, switching back and forth between the views of Zélie, Amari (the rogue princess) and Inan (the crown prince). Through these different points of view we are able to empathize with these characters. They are complex and distinct, with their reasons on why they do the things that they do and really allow you to care about them. While I end up reading multi POV books often even though I'm not a fan of them, in this one it really worked well to see all sides of the story in a more intimate way than the omniscient POV. If you didn't know, this book was already optioned for film when Adeyemi signed her book deal and I can see why. There's a cinematic feeling to this book that I could really see while reading it. I'm a very visual person and I often visualize things in my head as if I'm watching a movie when I read. There are definitely scenes in this book I would love love love to see on film, especially the bits when Zélie sees the painted images of the gods. I really hope that the studio does the book justice, because this could really be magnificent. While this book was a page turner and a great read, I wasn't blown away by the book as some were and I didn't understand the screaming about it. That is, until I hit the last 30 pages. HOooooLLYyyyy. Yeah the beginning of this review is brought to you by my own screaming. It ends on the perfect note of wrapping up the book, but also leaving you wanting to know more. I empathize with all those who read this book early and have to wait longer than I do for the sequel. Children of Blood and Bone is a West African cinematic fantasy novel with rich characters and world that you'll stay up all night to read. I had a great time getting to know these characters and this world and I can now join the others who await the sequel with great need. If you made it through that whole review, congratulations!! AND NOW WHAT YOU'VE BEEN WAITING FOR . . . . . THE GIVEAWAY!! It's simple really. Retweet the tweet below and follow me on twitter to enter the giveaway for a finished copy of this novel (courtesy of Raincoast Books). This is a CANADA ONLY giveaway! You can find the other tour stops below! Thank you!!! Yeah, the size of the book is pretty intimidating, but the writing is really good and you don't notice that you've made it halfway through until you start yawning a lot and realize it's 3 am. LOL. I mean it's not terrible, but I would just really like to know what's going to happen next.